Edmund Wilcox Hubard, Democrat | slate river ramblings . . . . 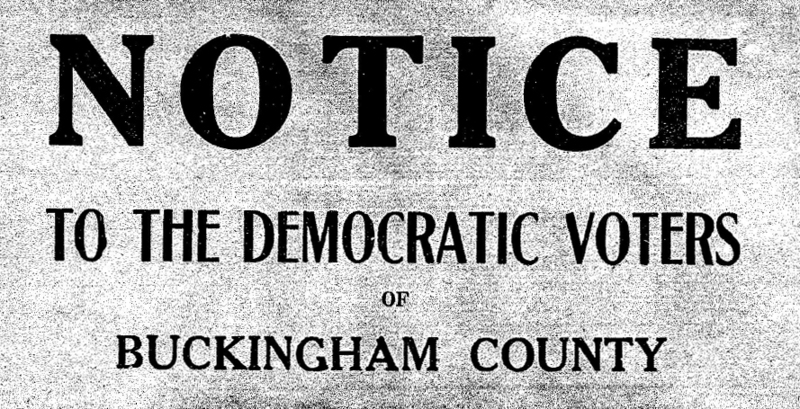 I hereby announce myself as a candidate of the nomination to the position of Commonwealth’s Attorney at the Democratic Primary Election on August 4, 1931. While I was prostrate in a hospital as a result of an operation, I was urged to become a candidate for Commonwealth’s Attorney at our last County Democratic Primary and was finally assured if I would simply allow the use of my name that my friends would do the rest, but realizing that a Public Office is a Public Trust, and not feeling satisfied at that time that I would be able to discharge the duties of that responsible position, I declined to become a candidate after expressing my deep sense of gratitude at the confidence and devotion thus manifested. But now I have fully regained my health and strength, and should it be your pleasure to nominate me, I solemnly obligate myself to discharge all of the duties of office to the best of my ability and you will receive the benefit of my long experience as a prosecutor. Six times I had opposition for the position of Commonwealth’s Attorney, and you endorsed my record by re-electing me each time by large majorities and elected me six times without opposition, and with a deep sense of appreciation and gratitude for those endorsements I am basing my claim of support in this canvass, as in all of my other contests, solely upon my record in office, for I have never assailed any candidate against me and will not do so in this canvass. In 1931, Hubard was about seventy-eight years old. Click here to read more about Edmund W. Hubard.